Getting a good workout in is hard enough, but throw kids into the mix and it becomes almost impossible. Or at least that’s what most people think. Maybe you’re an early riser so you exercise before your kids are up, or maybe you workout at night when they’re in bed. Whatever it is, it’s definitely easier to stay focused without kids screaming for your attention. Are we right? No matter where you’re at, we’ve found some great ways to involve your kids while still getting a good burn. If you’re into biking, you’ll want to involve your little one(s) so they’ll love it, too. Consider investing in a good bike trailer that allows for you to go some fun adventures together. You’d be surprised at how great a workout you get in just from pulling a bike trailer. Your legs will tone up in no time! So you love to run. That’s great! If your child is old enough, consider running together for as long as your kid can keep up, then when he/she needs a break, get a few good sprints in. If your child is little, a good jogging stroller will do wonders! He’ll enjoy being outside with you and learn at an early age how fun exercising can be, and how important it is. Hiking is a great way to get some good cardio in while exploring nature. Find an easy enough trail that your child can do, but somewhat challenging still. For extra little ones, a good backpack carrier can go a long ways. What kid doesn’t love to play games? Believe it or not, playing tag is a great way to get your heart rate up. When you raise and lower your heart rate, you’re burning fat. Tag doesn’t have to be played for an hour, but rather do a couple games of tag in between your workout circuits. Moving and grooving to some good tunes is not only fun, but another great way to burn some calories. Have a dance party in your kitchen, your family room, or wherever you want! Just blast that music and have fun together! Stand with a slight bend in your knees, and hold your child in your arms. Carefully curl your child up and down. Remember to keep your elbows turned in, and make sure they’re in front of your body. While seated on a bench, have your child sit across your legs while you perform the tricep dips. If you don’t have a bench, just sit on the floor with your arms in position, and one leg crossed over the other. Your child can crawl under you after you raise yourself each time. Either on your knees or your feet, perform a standard pushup while having your kid sit on your back. This is more challenging than you might think. If it’s too challenging with your child on your back, you can always rest him on the floor underneath you. This one is always a kid favorite. Lie on the floor, and have your child rest on your feet/shins (depending on their size) while you hold their hands/shoulders and raise them into the air. Then press your legs in and out and feel that burn. Depending on what’s most comfortable for you and your child, hold your child in your arms like a bear hug, or rest him on your back/shoulders. Then squat as normal. Rest your child on one hip while performing a side lunge on the opposite hip. Complete a few reps before switching the child to the other hip. This move is almost like a seesaw for the kids, so it’s super fun. Have your kids rest on your torso with your legs straight out in front of you. Then, keeping your core engaged, raise and lower your upper body. Scissor kicks aren’t easy, but they’re kind of fun to watch. Because your child will think they’re so fun, have them lie down next to you and copy you. You’re sure to get an even better ab workout with how much you’ll be laughing together. Downward dog is a great stretch that will elongate and release tension from your spine. It also opens the hips and shoulders, while stretching the hamstrings, calves, arches, and hands. It also strengthens your upper body. Just have your kids run under you like it’s a tunnel. They’re sure to have a blast with this one! Stretching is something that’s important, and should be done at the end of every workout to cool down your muscles and prevent pain and injuries. Do any other stretches you normally do, and have your kids do them alongside you. Because kids have fun mimicking what you’re doing. They’ll really love stretching with you. 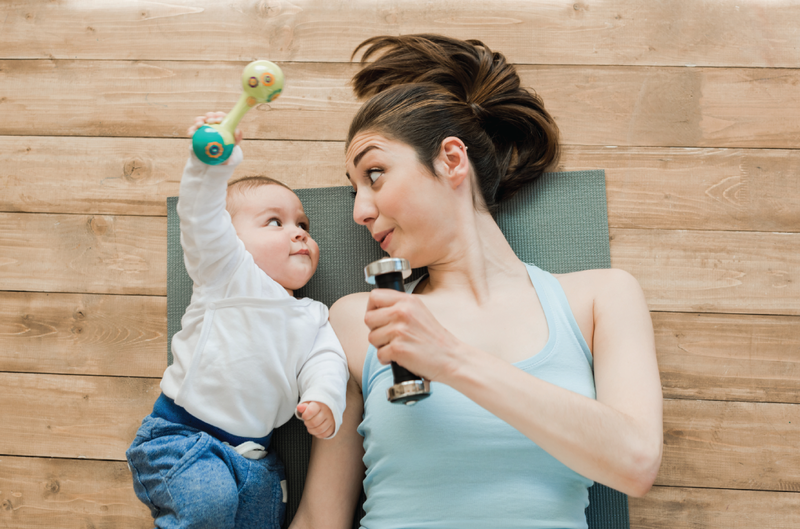 We hope you and your child have fun exercising together! Don’t forget to visit our facility to amp up your workouts even more. In just 30 minutes, you’ll have a total body workout (and your kid won’t even notice you’re gone). Try 30 days at KUBEX for only $10 (no commitment) for a limited time!